This is a familiar game on this last day of June. It's been reviewed twice across three different platforms so far. This Nintendo Switch review of Oceanhorn: Monster of Uncharted Seas is now SuperPhillip Central's third look at the game. What can I say -- I'm a sucker for Legend of Zelda-like adventures! Here's my review of Oceanhorn: Monster of Uncharted Seas for the Nintendo Switch, recently released on the Nintendo eShop for $14.99. 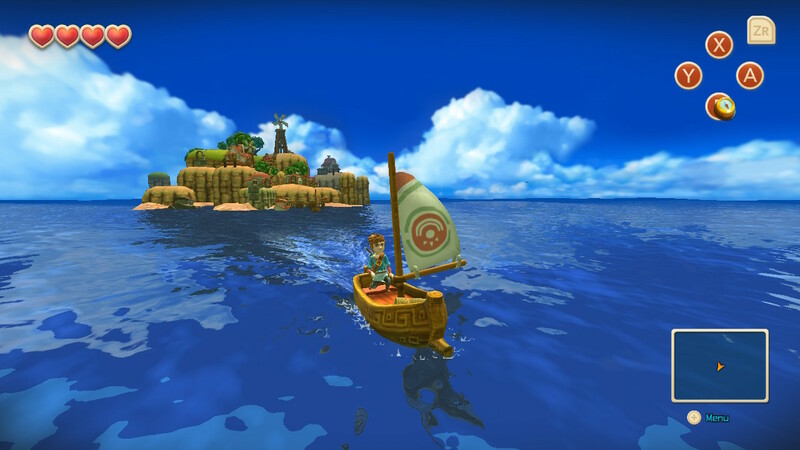 Doesn't out Zelda Zelda, of course, but Oceanhorn is a competent Zelda-like all the same. Oceanhorn: Monster of Uncharted Seas has seen a release on multiple platforms in the past (I even reviewed it once on iOS and then a second time on the PlayStation 4), and now this Zelda-inspired game is on the Nintendo Switch. Finally, a game modeled after Zelda releases for a platform made by the company behind the storied franchise. You might wonder why you would want to even bother with a secondhand Zelda-like when there is the real deal already on the system and in a big way with The Legend of Zelda: Breath of the Wild. For one, Oceanhorn doesn't have full 3D movement or even an open world. It's an isometric action-adventure game whose areas span multiple elevations and the like, and exploration is occasionally based off of mastering how to cross the undulating areas for treasure and special points of events. The second reason that Oceanhorn might be of interest to not just Zelda fans but those who crave an actual-adventure game on a budget is that the game is overall rather good. It doesn't make huge strides towards shaking things up or pushing innovation, but Oceanhorn is a consistent and enjoyable gaming experience regardless. The isometric camera angle and focus on elevation gives Oceanhorn a unique hook despite being a Zelda clone. 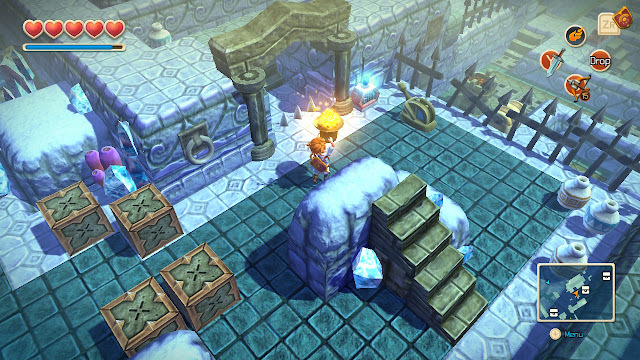 Oceanhorn starts off relatively slowly, introducing the basics of the game to players on the Hermit's Island. Your nameless hero wakes up and talks to the titular hermit living on the island, and is tasked with reclaiming his father's sword and shield in a nearby cave. The game doesn't hold your hand like many modern Zelda games had done so before Breath of the Wild, so all you really get for help are optional-to-read signposts along the way. The cave itself introduces simplistic puzzles to solve, but really, most, if not all of Oceanhorn's puzzles throughout the entire experience don't revolve around too much critical thinking. You won't really be perplexed all too long at all by any stretch of the imagination. Other than puzzles, mostly block-pushing fare, there's the typical need to find keys to unlock doors to progress. After you've acquired your dad's sword and shield, the true adventure begins. It's then that you can go to new islands on the uncharted seas. However, there is a severely limited amount of freedom to do so than say another Legend of Zelda game, the GameCube's Wind Waker. Islands aren't automatically available to you on the ocean map. You have to talk to specific characters and examine certain objects to get keywords that will then open up those places for travel on the ocean. Not every island in the game is mandatory, but the story-related ones are usually quite easy to find their keyword to progress. The optional ones take a modest amount of exploring to uncover through the game. Don't expect to sail with complete freedom in Oceanhorn. It's much more restricted here. When you do actually set sail, you merely select an island to move across the ocean towards. Thankfully, if you change your mind on your destination, you can alter your course by selecting a new island mid-trip. At the start of the game, there is little interaction while sailing. You just sit and wait until you arrive at your intended island of choice and that's it. Thankfully, your small boat sails at a speedy enough clip that makes each trip serviceable instead of completely tedious. Once you reach a certain point in the game, you get a seed cannon added to the boat, allowing you to shoot at boxes, mines, and enemies in the water for coins, ammo, and other goodies. 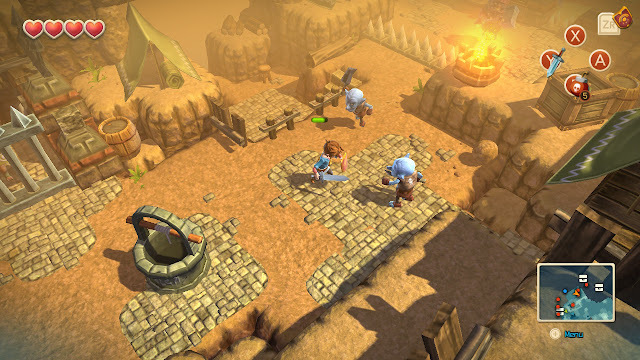 Playing Oceanhorn features controls that are responsive but sluggish combat. Sword swipes don't always hit their targets, so you can sometimes be swinging wildly to no effect, only hitting rocks and walls instead of enemies. That said, movement with the Switch's analog stick is great. Much better than what was offered on mobile, and equal in feel to the PlayStation 4 and I imagine any other dedicated gaming system controls. Only one sub-item and one magic spell can be equipped at once, but they can be cycled through with the up and down directions of the left Joycon's d-pad. Sub-items include Zelda mainstays like bombs and a bow and arrow, but also a boot that allows you to jump over square-long chasms with ease. Combat is sufficient enough, but does have its slight issues. 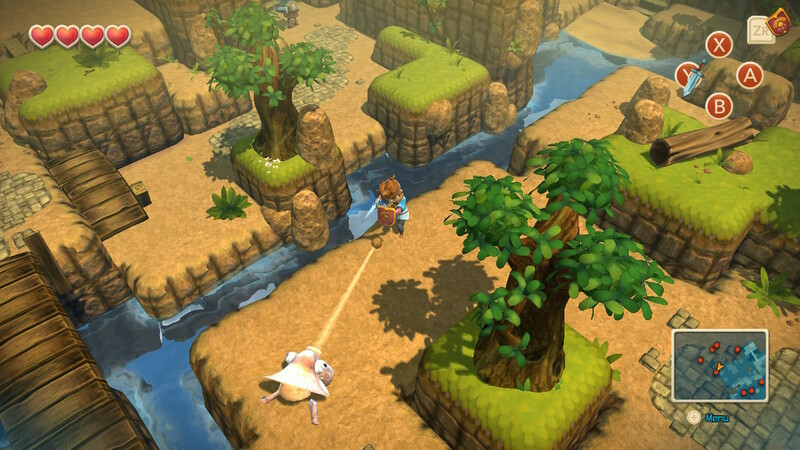 Oceanhorn has an upgrade system for your character that rewards you with experience for defeating enemies, uncovering experience shards within treasure chests, and completing certain island goals. These are as simple as reading 10 signs, pushing blocks 100 times, mandatory story-related objectives, and more. When you reach enough experience, your level increases, rewarding you with a new bonus such as the ability to carry more bombs and arrows, an increase to your energy meter, and so forth. 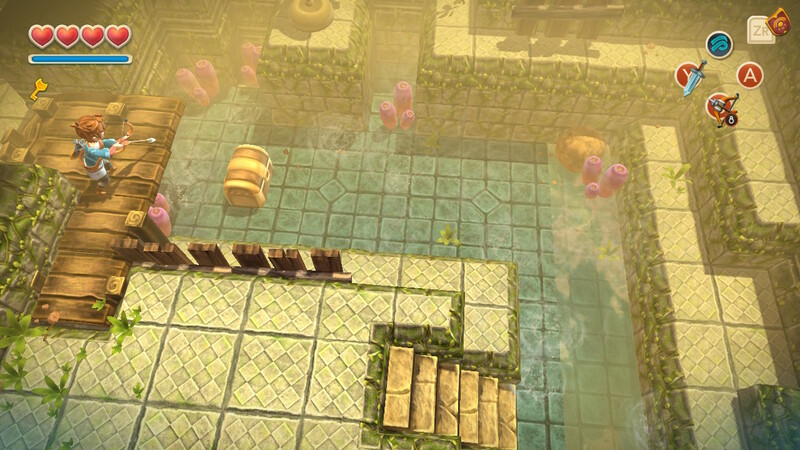 Like any dungeon of value, this forest dungeon has its fair share of puzzles and exploration. Outside of the isometric view and the experience system, Oceanhorn strays a little too closely to The Legend of Zelda series' formula and structure. For instance, the item set is traditional Zelda, dungeons house small keys, puzzles, and most obviously the Master Key that unlocks the dungeon's main treasure and boss door (very Zelda, that one), and you need to acquire four heart containers to increase your health. But some of the influences of Zelda just aren't executed as well, such as many of the boss battles that feel low in polish. While this one ups the ante puzzle and challenge-wise. Despite these moments of error, Oceanhorn: Monster of Uncharted Seas on the Nintendo Switch is an engaging adventure from beginning to end. Obviously it's been good enough and enjoyable enough that I've managed to play through it on three separate occasions on three different platforms. Each time, of course, I see more and more minor flaws that change my overall thoughts of the game. One part that remains great to me is the presentation with a lovely soundtrack mostly by Kalle Ylitalo with some additions by famous Japanese composers Nobuo Uematsu of Final Fantasy fame and Kenji Ito of Mana and SaGa series fame. The world is colorful and delightful to look at, though with the block-based world design, you can see small holes occasionally between adjacent corners of blocks. It's definitely dated graphically, especially since it was originally a lower budget mobile game from years ago, but I overall like the look of Oceanhorn. 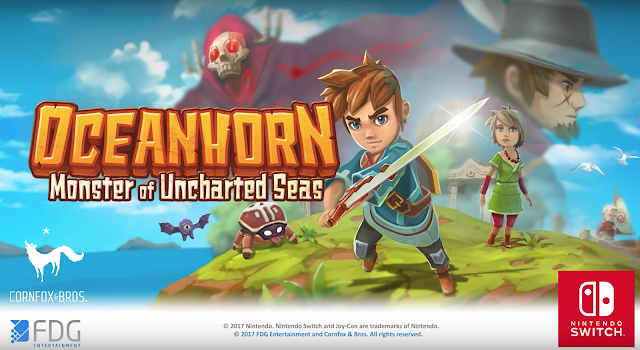 If you want a different kind of Zelda-like gameplay romp on your Nintendo Switch with a campaign that will last you at least 7-10 hours if you're not rushing through just to finish the game but actually exploring the world, then Oceanhorn: Monster of Uncharted Seas isn't a game you should sleep on. You may have on another platform already, so if that's the case, there really is no benefit of getting the Switch version again unless you really want to have the privilege of switching between docked play and portable play at any time. Oceanhorn is indeed a Zelda clone, but it being isometric and overall competently designed makes it a winner and a fun game to replay in my books -- or, in this case, adventure log.